Tomorrow I'm going to pollinate a second pumpkin on my son's 335 Scherber plant. That pumpkin is the product of a clone of the plant that grew a 1775 pound pumpkin crossed with a plant that grew a 1663 pound pumpkin. Tomorrow I'll be pollinating it with a clone of world record 2009 pound pumpkin. On paper it is a very impressive cross. My sons plant is very impressive for the space it has and the quality of the soil it is growing in. My son's personal best pumpkin was about 230 pounds and he is already over 150 pounds with two months of growing left to go. This evening I gave a foliar application of 0-1-1 with some liquid seaweed in it to the 1775 plant. Also sprayed the vines after the fruit on the 1421 plant. The 1775 is still moderatley slow growing so I'm hoping this will give it a little umph. I found a small parallel slit in the main vine this morning. I put some sulfur powder on it and have shielded it so that it can't get wet. At this point I'm not very worried about it but it will be something to watch closely because it is before the stem and if it rots out the season will be over. This evening I sprayed some CO2/Lithovit mixture on both of the pumpkin plants. Warmer temperatures in the forecast for Colorado over the next few days. If you've followed my posts you'll know that not that long ago I talked about making sure you cut the tap roots around the pumpkin so that the main vine can lift up as the pumpkin grows. I was getting the vine bound up against the pumpkin over the last few days so I asked Joe to help me move the pumpkin back to get it out of the way of the vine. Joe caught something that I didn't. One tap root wasn't cut which was part of the problem with the vine. A silly rookie error. The root was cut and with some effort we moved the pumpkin carefully out of the way of the vine and things look good for another few weeks. Even with the very cool and rainy weather in Denver the last couple of days both pumpkins have put on some nice growth all considering. Warmer days to come so we will see what these pumpkins can do. I sprayed some multi-mineral with a touch of metasolate calcium added on the plants. I believe that times of low precipitation and high precipitation can cause calcium to not move properly through the plants so adding a little extra calcium I hope to reduce the risk of dill rings and blossom end splits (BES). Because of the tall shape of the 1421 pumpkin I fear that I'm susceptible to BES. These are pictures of Stanley and Elbert. Both have made very nice gains this last week, even though the weather has been abnormally cool (Stanley set a new personal best yesterday for one day gains and has doubled its weight over the last week). The 1775 plant is probably 2-3 days from having filled in all its available space and then it will be terminated on all vines. The vines have grown like crazy the last three weeks and I'm hoping that after it is buttoned up then the main sink will become the pumpkin for even better growth. This morning I sprayed some Vegetable & Fruit Yield Enhancer on the soil under the canopy. It is a mixture of beneficial bacterial, myko and 3% humic acid. I also gave the plants a foliar application of magnesium sulfate for the magnesium and the sulfur. Sprayed some insecticide this evening in the patch. I don't prefer doing that but after losing a plant last year to a virus spread by the Squash Bug I've decide it is the best way to go. Cooler weather in Denver this week. Not overly cool but not the ideal time for cool weather when the pumpkins area really packing on the pounds. Hopefully the rain we got this afternoon will give them a little push. This evening I gave the plants some foliar multimineral with some Fox Farms Big Bloom added in. Usually I don't like to post weights and measurements for the pumpkins because only the scale tells the truth. But this morning's measurements show that Stanley the pumpkin put on 37 pounds yesterday which is a single day best for any pumpkin I have ever grown. And since the pumpkin is on day 28 I think there still room to see some higher numbers in the coming days. I'd really like to see one 40 pound day, but no much more than that. More importantly I'd like to see two weeks of big growth days. There is an old saying in pumpkin growing, "If you ain't blowing them then you aren't growing them." Basically meaning that if you aren't pushing the pumpkins hard enough to get them to their maximum potential and potentially ripping them at the seams then you aren't trying hard enough. There is also an almost equally as old saying that says, "If you are blowing them then you aren't showing them." Meaning if you blow your pumpkins up then then you aren't taking them to the weigh-off. Today I took a bit of a risk. I've got too much nitrogen in the soil on the 1775 side of the patch so I decided to try to flush some of that nitrogen out by over watering that side of the patch. At about 11:30 this morning I watered the patch for an additional 50 minutes after watering for the usual 12 minutes this morning. It was about 95 degrees in Denver today and the pumpkin is just about to go into its rapid growth stage so I figured this might be my last chance to do this so I took the chance. If the pumpkin stays together and I can get some of the nitrogen out of the soil then I'll be in better shape. This isn't something that is advisable however. This even I gave both plants some compost tea and a foliar application of multimineral with humic acid. The first picture is of the 1421 Stelts (Stanely) and the second is the 1775 Starr (Elbert). Elbert was a really disappointing pumpkin early on but I still have hope for it. At day 20 it is the shiniest that it has ever been and over the last few days its circumference measurements increase in inches have been on par with what they should be right now so maybe it is just a late bloomer. Stanely is by far the best pumpkin I have ever had. The 10 day measurement I think was the only measurement that I've had that was behind any previous pumpkin that I've grown in the past. It has just been a fantastic plant so far. The one thing that I would like to see out of this plant still is more vine growth after the pumpkin. I think for this plant to continue to drive the pumpkin in the later part of the year I need a bunch of new growth and at this point I'm not seeing it like I would like. However, my hope is once the vines after the pumpkin get rooted I can start seeing some better results. This plant seems to root very well. The vine growing on the 1421 hasn't ever been aggressive but hasn't ever been slow either. It has been a descent grower. The main vine is already as long as last year's plant and we still have two more months to go. This evening I gave the 1775 plant some liquid seaweed to encourage it a little. Yesterday it got to about 91 degrees in Denver. I noticed in the late afternoon that the ground was looking a bit dry. Right now I have the Dan Micros set to run for 11 minutes each morning. And then I mist the plants from 10:30 to 5:30. I was a bit surprised to see it lightly dry. Growth on the 1421 pumpkin (Stanely) was down 2 pounds yesterday which can easily be cause by a mis-measurement but it was against the daily upward trend that I've been seeing for the past week so today I decided to try an experiment. Today it hit about 84 degrees in Denver. A fair amount cooler than yesterday but I watered the patch an additional 4 minutes today to see if it made in difference in growth. I'll check the pumpkin again tomorrow and find the results. I can't say I've ever felt like I've got the watering thing down perfectly. This evening I did a foliar application of Multimineral with yucca and a small amount of Big Bloom in it. After some research I've added two things to my foliar applications. A little Nourish L (humic acid) and Desert Nectar (yucca) is now put into my sprayer. The nice guys at Arvada Hydro gave these to me for free to try. Humic acid is something very good to put in with foliar applications because it is a natural chelator, which basically means it can help nutrients get into the leaf. I recently read an interesting study on how humic acid can help get calcium into the leaf via foliar applications and transport it into the fruit which is very interesting and promising. More calcium in the fruit, some believe, means less blossom end splits. The yucca that I've added to the foliar applications is is a mild non-ionc spreader (sometimes also called a sticker) that can help spread a foliar application across a leaf by keeping the water from beading up which means better absorption. I've known about spreaders for some time but haven't ever tried it. This evening I sprayed some small quantities of Lithovit, Albion Organic Multimineral and magnesium on all of the plants. This morning I gave the pumpkin plants some compost tea that had worm castings, big bloom, alfalfa and molasses in it. No real fertilizer at this point for the plants because we have had a lot of rain lately and when thing warm up we don't want the pumpkins to go boom. Slower growth on the pumpkins yesterday. I think it only got to about 80 degrees yesterday and the entire morning was rainy and cool so not a lot of activity. A little warmer today and then a stretch of high 80s and low 90s which is going to be perfect for the rapid growth phase of the pumpkins. The 1421 should be kicking into full gear in about 3-4 days so nice weather will only help pack on the pounds. My son's 335 Scherber pumpkin is looking really, really good. I wish I could remember what day he pollinated it on. It had a measurement of 31.5 inches this morning and if I remember correctly it was pollinated on the 5th or 6th. That is phenomenal growth for what isn't a very big plant. The hardest part about growing giant pumpkins is that there are 1,000 different pieces to growing a big pumpkin and those pieces change from time to time. Two years ago I had insect problems, least year it was heat some time in the future it might be rain and the potential list goes on. Also growing in Colorado isn't the same as growing in Ohio or California. Every area has their unique challenges. That is part of what makes this so fun. It isn't easy. It can be heart breaking. But the hope of growing a really big pumpkin keeps me coming back. One tip I would give anyone that wants to grow a giant pumpkin is make sure you do the basics very well. 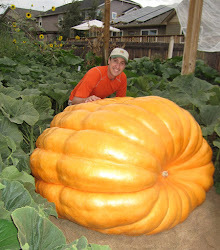 Get your soil tested and understand what is required in a soil to grow a giant pumpkin. This is an ongoing effort but the basics, if you can find someone to guide you are somewhat simple. The next tip would be to understand the different cycles that a pumpkin plant goes through during a season. This takes time to learn but when you recognize what a plant is doing you can take advantage of it. The last time is to understand proper watering. This also isn't quite as simple as it would seem but again the basics are pretty simple. Keep the soil lightly moist. Tripled the amount of alfalfa that I put into the soil in the fall and spring. Used about double the amount of bilogicals on the soil this year that I have used in the past and with that I added beneficial nematodes to the soil in the Spring. Did a cover crop that I tilled in later and I put down myko with the cover crop. A lot of this came with the alfalfa but I also added probably 125% nitrogen to the soil then I have in the past. One interesting thing that I learned from my tissue tests is how some nutrients get bound up in the soil or are not able to get absorbed. My soil isn't balanced as I would like. My potassium is too high and as a result it isn't allowing other nutrients to get absorbed as they should because potassium is blocking the cations so minerals aren't getting absorbed as they should. For example, I have lots of sulfur and zinc in the soil but my tissue test showed me low for both items. As a result I'm doing foliar applications now to make up for what the roots aren't able to get. As I've mentioned before, it is easy to get excited in the early part of the season about the salad part of the pumpkin plant, but really roots are the most important things you can grow for the first month of the season. Nitrogen will make the vines grow but without a healthy root system you will never get a big pumpkin. That is why I use myko and azos on my plants, to help build the root system. When walking through the patch this evening I noticed little pumpkin roots popping through the soil about 12-15 feet from the stump. I shot some video of them in case you wanted to see. Try playing the video full size for the best view. This evening I sprayed Nourish-L onto the ground under the leaf canopy. I figure that while those roots were popping out I had an opportunity to get some myko and beneficial bacteria onto them. I also sparyed for bugs on both plants. Below are pictures from early this morning in the pumpkin patch. Looks like the 1421 is going to end up a nice orange one. I think it is the first pumpkin I've had that has been ahead of the charts. This evening I gave the pumpkin plants a foliar application of Albion's organic Metalosate Multimineral. My tissue test came back fairly normal except for about 4 minerals and the Metalosate Multimineral had everything that I needed in it. I like their product because everything is chelated and it is chelated in an organic way that I believe may be more absorbable by the leaves. I've used their calcium product for the last two years and have liked it. Leaf burn hit the 1775 plant hard on the new growth this last week and although the overhead mister was running while I was out of town it doesn't run as much as when I'm in town. I'll often run it manually during the heat of the day on really hot dies while I'm here. About two feet of new leaves are melted on a number of the vines. The 1421 pumpkin (Stanley) grew very nicely this last week. More than I anticipated. I got in this evening and I haven't put a tape around either pumpkin yet. We are past the 10 day mark on the 1775 Starr which means the pumpkin is set. Now we just have to grow it big. I really like the shape of the 1421 Stelts. This should be a smooth skinned pumpkin and possibly an orange one. The goal is to always grow big, but if you can get a nice orange pumpkin that is a bonus. The following are my two pumpkins that I'm planning on growing. The first is the 1421 Stelts pumpkin (aka Stanley). The second is the 1775 Starr pumpkin (aka Elbert). I have big hopes for these two pumpkins. Stanley is 10 days old today and has a circumference of 23.5 inches which is 1/2 short of tying a personal best for a 10 day measurement. The 10 day measurement means nothing but you always hope for bigger rather than smaller. The 1421 is a bit of a bowling long with a touch of length to it. The 1775 is long in shape with a big of ribbing already. This evening I gave the plants a foliar application of Big Bloom, phosphate 0-1-1, calcium and CalCarb. I won't be giving anything else to the plants for a week. A week ago I sent in a leaf from my 1775 Starr plant to get some tissue testing done. I've never done a tissue test although I get my soil tested every year. Sometimes, even though you have more than adequate nutrients in the soil the plant can't get at them for a variety of reasons. My tissue test came back with everything in normal range except my nitrates were high and my sulfur, zinc, manganese and copper were a touch low. I'll give the plant some foliar applications of each to get them back into normal range. Starting in August if my nitrates are still high I'll give the plant so foliar phosphorus applications to help with the nitrates. This evening I gave the outer areas of my plant some kelp meal on the soil. The kind I used had some beneficial bacteria mixed in with it. I also sprayed on the soil, under the leaves, some liquid seaweed with Life Hydroponics Vegetable & Fruit Yield Enhancer. For the first time I went into the Hydro Store in Arvada today and began talking with the gentleman running the shop. I found him to be a super nice guy and I told him that I grow giant pumpkins. He gave me a number of bottles of free samples including the Hydroponic Life products so I put some of it in with the seaweed. If you are in Arvada stop by the Hydro Store off of Wadsworth. The Life Hydroponics Vegetable & Fruit Yield Enhancer has humic acid, some benefical bacteria and myco in it so on paper it looks like some descent stuff. Not a lot of fun these lots couple of days. I had fallen behind on wedding and vine burying and I've been hurrying this evening to get caught up. The 1775 plant has really kicked it into gear on the side vines. I buried most of them yesterday evening and this evening they were almost ready to be buried again. The root system on the 1421 plant is very impressive. I've finding good sized roots why out of the plant which is a good thing. It has been pretty cool in Denver the last four days but warmer days are ahead for the next 5 days.